Read how one man has found a real blessing in Meals on Wheels—because of YOU. When you walk into Steve’s apartment, the first thing you notice is the minimalism. Steve only keeps and displays what is important to him. Photos of his two beautiful daughters and handsome grandson are arranged artfully on end tables, as well as evidence of his strong Christian faith. He also has a few snapshots of smiling children, their glow contagious. When asked, he’ll tell you that they are Meals on Wheels volunteers—some of our youngest—who have bonded with him like no other. “I got to know a whole family, got friendly with the kids. They became like my own kids. This family—on their own family time—had a meal with me on July 4th. Made me feel special,” says Steve, also mentioning that his daughters are reassured that he always has someone checking on him through Meals on Wheels. Steve has been a Meals on Wheels client for about three years. He began receiving meals because of his lungs. He needs to be on oxygen, which limits his physical activity but has not dampened his magnetic spirit. 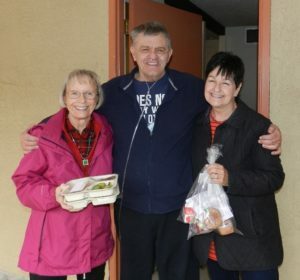 Volunteer Drivers, Marilyn and Sharon, adore Steve, and he adores them! His charcoal-blue eyes are thoughtful. “It may sound simple to people who have help, but when you are disabled, it’s quite a great thing to know someone’s going to bring you food that day. When you’re healthy, you don’t think about things like that.” Because of your partnership, Steve can stay in his apartment, living out the life he began in Albuquerque over 20 years ago. Steve is one of the most interesting people you will ever meet. A captivating storyteller with a near-photographic memory, Steve’s held a myriad of jobs in his life, including working in radio and gaining celebrity with his talk show in Colorado. Steve has formed meaningful relationships with all of the Meals on Wheels volunteers. “As a disabled person, you don’t expect the person at the door to be your friend. But they are friendly. They take time with you and ask you questions. Those ladies on Friday are more than acquaintances. I love the program. I like the fact that there are people out there in the world that are willing to contribute to a program like this that helps people like me. People out there that care about me and know that they have legitimately helped people.” This interaction is so important because most clients don’t see anyone other than a MOW volunteer every day. Our volunteers would readily admit that Steve’s illness hasn’t taken away his vitality and zeal. Quite the comedian, Steve can make anyone laugh. Resistance is futile! Please know that your partnership brings hope—and humor—to people like Steve who have so much wisdom and love to offer this world.